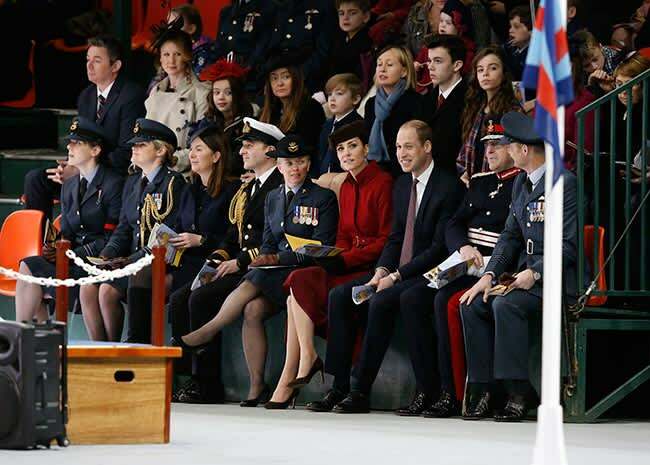 Kate Middleton turns heads with chic outfit at RAF parade | HELLO! The Duchess of Cambridge has been pulling out all the stops this week, showing off her impeccable style at a series of events. The 34-year-old looked the epitome of elegance on Thursday as she joined Prince William on a visit to the Royal Air Force Valley. For the special event Kate chose one of her go-to designers, L.K. Bennett, wearing the label's gorgeous red Ami coat which features a belted waist with gold buckle detailing. It's not the first time she has worn the coat - she has chosen it for a series of past appearances including a visit to Copenhagen with William back in 2011. Her accessories complemented the look perfectly, with the stylish royal opting for a brown Lock & Co. hat, teamed with heels, gloves and a clutch bag in matching shades. When it came to her hair and make-up, Kate chose a simple yet stunning look, sweeping her glossy brunette tresses back into a sleek ponytail. William and Kate travelled by helicopter to the base to attend the Search and Rescue Force Disbandment Parade, to honour the end of more than 75 years of the RAF SAR UK operations - an organisation particularly close to William's heart, as it was where he served as a pilot. Less than 24 hours before, Kate was also turning heads as she gave us all major work wardrobe envy while she took on her guest editing role of The Huffington Post UK on Wednesday. The mother-of-two, who worked in a temporary newsroom set up at Kensington Palace, showed off her effortlessly elegant style, mixing designer and high street pieces. Looking ever the professional, Kate turned to one of her favourite stores, Reiss, turning heads in the label's £120 Vinnie Blouse, a cream high-necked shirt with button detailing. The mother-of-two also showed off her high fashion credentials, pairing the striking blouse with a black-and-white wrap skirt from Italian designers Dolce and Gabbana. The British beauty left her glossy brunette locks worn down for the occasion in one of her world-famous blow dries, parting her fringe to the side for laidback elegance.